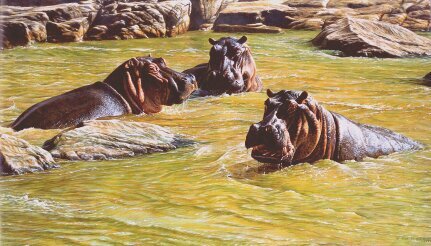 The hippopotamus is a very large African animal. It has a blue-grey body with a pink underbelly, a large head, stumpy legs, and can weigh over 3 tonne! The males can weigh between 1600-3200 kgs (3600 - 7000 pounds), and the females between 650 - 2300 kgs (1400 - 5200 pounds). Hippos like to wallow about in the water, due to the fact their skin is quite thin - and if they are not submerged in water they are vulnerable to dehydration. Although these are enormous animals, they usually walk up to 3-5 kms (2 or 3 miles) in a day. Amazing Fact: Despite their size, hippos can gallop at speeds up to 30 km/h (18 mph). 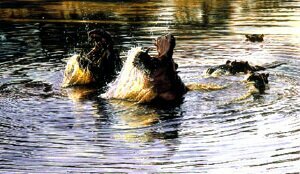 Hippopotamus is spelt with an a, not an o, as the common misspelling is hippopotomus. Hippos can eat up to 40 kgs (88 pounds) of short grass in one day!